Crime is a word that in our everyday life has a negative connotation, but Durkheim believed crime is an integral part of all healthy societies. Durkheim described crime as an act that offends certain very strong collective sentiments. He said that crime was not the intrinsic quality of an act, but the definition given by the “collective conscience” of society. Therefore are not what you do that matters, but how society sees your acts. Durkheim believed that crime was essential to form change; therefore it should not be conceived as an evil to be suppressed. A healthy society has crime, which allows for flexibility and easier accommodation to political and economic change. Many of the acts that were seen as crime are now admirable. For example Socrates was killed because of his teaching but they later on served as a ground for morality. Many strikes and riots where seen as crime but they brought forth the ideas and serve as ground for growth in society. A concept that is seen so negatively in society, Durkheim explained it in a way which makes it more acceptable to society. Since Durkheim was a functionalist, he believed everything that existed had a purpose. Crime is normal according to Durkheim and I completely agree. As we mentioned in class, there is no society in which crime does not exist. There is no such thing as a perfect Utopian society. In one way or another crime is always present. Crime functions to point out what is accepted and not accepted in a society, which then introduces laws. Laws serve to mark the boundaries people should not transcend. I think Durkheims theory is so important because years later we still recognize crime, we see it every day in the media and all around us. Laws shape our everyday lives. A great example of how crime varies in different societies is the fact that some cultures allow men to have more than one wife, however in the United States that is seen as a crime, with the punishment of divorce. Two different societies have two very different views on the idea of marriage. If Durkheim were alive today I think he’d be intrigued by crime, specifically how it brings society together. For example, the Sandy Hook Elementary School shooting was devastating, it shocked the entire nation. The media, and social networks spread the news instantly. A terrible crime had been committed, and the nation remained unified. My Facebook feed was overflowed with pictures of the crime scene and prayer statuses. Although people did not personally know the families of the victims, they prayed for them and every person understood the depth and seriousness of the crime. Similar to Durkheim’s findings of how war unifies people, I believe crime does too. Two terrible events result in the unification of society. This is interesting because it is pure Durkheim, people need to feel a part of something, and supporting a cause definitely unifies societies. Finally, the last question I was left with was what a society would be like without crime? But then I realized I can’t even picture this because crime is such a normality is society that it is hard to imagine one without it. It was astounding to see the historian blame the London riots on the “black culture”. That goes to show that anything deviant that does not pertain to the roles mandated by the authorities and high class, ‘white’ society will be blame on the minorities of color. Now that I see why the riots occurred, it is baffling that it is even suggested riots being a consequence of ‘black/urban culture’. They are social issues, not racial ones. This is not limited to London, here in the United States it is extremely visible with how crime is portrayed in the media. White killers are always attached to some mental illness or temporary outrage, while any other race is immediately thought of as “evil” or “influenced by their culture” (poverty, stereotypical ‘urban culture’- for lack of a better term). In the Dominican Republic, Haitians born in the country are not granted citizenship- due to their darker skin tone (there’s a history of discrimination in the country because of racism), human rights organizations are outraged. The treatment of race in the media and the government only adds to the racial profiling of people in all aspects of society. 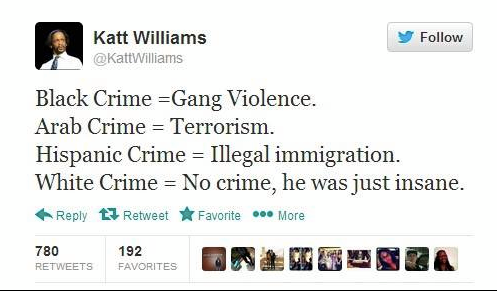 (In this tweet by comedian Katt Williams, he clearly differentiates between the handling of crimes in America according to one’s race/ethnicity- stereotypes are powerful if given constant attention). Functionalism makes so much sense. The only way a society can remain relatively stable is if each member of society does his or her part because each of those parts is crucial and significant. Durkheim, a functionalist, uses this idea to explain why crime is not only normal but also functional. The purpose of crimes, he explains, is to reinforce the norms. Of course people are not supposed to go around encouraging and promoting crime but realistically, there are those who cannot hold themselves back from breaking the law, and those people actually help society distinguish between good and bad. They are the people who teach society what NOT to do. Beyond that, I think there are other reasons why crime is necessary. Not only does it distinguish between good and bad but it teaches in a more general sense that in life there are certain things you can and cannot do even if it is not necessarily breaking a law. Another reason why I think crime is necessary is because there are so many people who are passionate about bringing justice to the world. People involved in law, criminal justice, police force, security, etc. Most of these people not only enjoy what they do but rely on these jobs for income.